Business News›News›Elections›Lok Sabha›Uttar Pradesh›Lok Sabha polls 2019: Will Congress field Priyanka Gandhi from Varanasi? Much will depend on how the UP gathbandhan reacts to the possibility of Priyanka’s candidature and whether it is agreeable to conceding the seat to Congress, should she decide to contest. 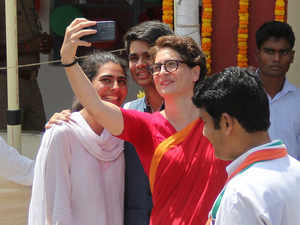 NEW DELHI: Amid growing murmurs over the likelihood of Priyanka Gandhi Vadra contesting the 2019 Lok Sabha polls, Congress on Saturday refrained from announcing its candidate for Prime Minister Narendra Modi’s Varanasi constituency. Varanasi again failed to feature in the list of UP seats for which the party declared its nominees on Saturday. Congress leadership remains tight-lipped about speculation over Priyanka’s candidature and Congress spokesperson Randeep Surjewala refrained from scotching the possibility of the younger Gandhi sibling entering the Lok Sabha fray. “Any decision in this regard will be communicated once it is finalised,” he said. Party sources said internal surveys have been conducted in both Allahabad and Varanasi to assess the Congress’ strength in the seats. The party has not declared its candidates on both seats yet. On Saturday, it shifted Rajesh Mishra, winner from Varanasi in 2004, to neighbouring Salempur constituency. In 2014, party’s Ajai Rai was routed. Priyanka formally entered party politics earlier this year and was appointed AICC general secretary in charge of UP East. Party sources said she was keen to take the field against Prime Minister in 2014 too. She is seen to be the most effective candidate to contest against Prime Minister Narendra Modi, who is seeking a second term from Varanasi. Even though a section of the Congress believes that this may be a losing battle for Priyanka — a risk the debutante should not be exposed to— others hope that her entry might pin PM Modi down in Varanasi, hamstringing BJP’s campaign. Much, however, will depend on how the UP gathbandhan reacts to the possibility of Priyanka’s candidature and whether it is agreeable to conceding the seat to Congress, should she decide to contest. In the division of seats between the gathbandhan partners, Varanasi is to be contested by Samajwadi Party, where it is yet to announce a candidate. Sources said this may not pose a major hurdle as Priyanka and SP chief Akhilesh Yadav have had a good working rapport since 2017, when Congress and SP entered into an alliance to contest the assembly polls in UP, and Priyanka’s candidature, if it comes through, may be seen as a means to sharpen the opposition onslaught on BJP. Making a desperate bid to improve its chances at the hustings after it was elbowed out of the SP-BSP-RLD gathbandhan, Congress has also been hard at work forging alliances and roping in estranged leaders to fight on its symbol. In one such contest, the party on Saturday declared the candidature of Apna Dal president Krishna Patel, the estranged mother of Union minister and Apna Dal (S) chief Anupriya Patel, from Gonda. While Anupriya Patel will be pitted against Congress’ Laliteshpati Tripathi from Mirzapur, mother Krishna will take on BJP’s Kirtivardhan Singh in Gonda. Congress also announced the candidature of dacoit-turned-politician Phoolan Devi’s husband, Ummed Singh Nishad, from Ambedkar Nagar. In a surprise move, however, the Jaunpur seat, where Congress’ national minority cell chief Nadeem Javed was believed to be in the contention, was given to Devvrat Mishra.